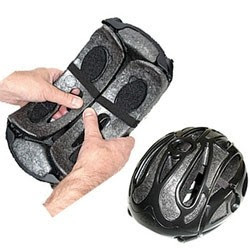 Sometime back, UK based company Stashkit brought out a multi sports helmet that can be folded and inverted at the sides to about 60% claimed reduction and 330 grams of weight. Attractive organic styling is used for the injection-molded ABS (acrylonitrile–butadiene–styrene copolymer) outer shells bonded to EPS (expanded polystyrene foam) liners. Stash uses quality ABS material from brand name Terluran® known for its high-quality surface finish and good gloss. It also has a high scratch and abrasion resistance and is unique in such an application. 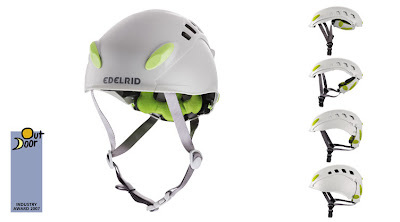 German company Edelrid Sports also came up with something similar in their Madillo but it is for rock climbing. The background idea though will tick with bicycle commuters, especially those with big heads that don't really know what to do with their 'pots' when off the bike. Click here to view a Stash helmet drop test for impact absorption, if you have not seen one before. This is a standard metal anvil test done in a laboratory setting (with data analysis capture facility) where the helmet is placed in an instrumented head form, turned upside down and dropped for a measured distance. 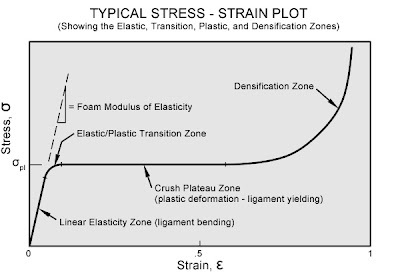 If you want to delve more into the engineering failure analysis of bicycle helmets with EPS liners as shock absorbents, you could read this research paper as a starter from two mechanical engineering researchers in Taiwan. The paper is interesting because it states that there are external environmental influences, like relative humidity and pre-compression values to take into consideration in helmet design. You can also read my past post on "How a Bicycle Helmet Works" or visit the Stash helmet website here.